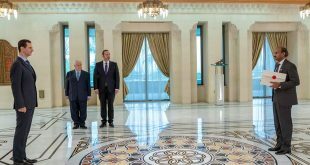 Damascus, SANA – President Bashar al-Assad on Wednesday attended a ceremony organized by the Martyrs’ Sons and Daughters Schools Establishment to honor the children of martyrs who followed in their fathers’ footsteps and joined military academies. President al-Assad addressed the children of martyrs and the schools’ staff members, saying that he feels great joy when he meets the sons and daughters of martyrs, and that he wanted to join them on this occasion, which takes place on Martyrs Day. President al-Assad stressed that Martyrs Day has many values associated with it, some of them symbolic, and some very tangible linked to the history of Syria, as around 100 years ago, the Ottomans carried out a campaign of arrests and executions of Syrian patriots and nationalists which culminated in 1916 when a large group of nationalists were executed by the Ottomans for defending the Syrian people from oppression. His Excellency noted that the Ottomans’ crimes at that time weren’t restricted to nationalists; they also committed heinous crimes against millions of Armenians, Syriacs, and other groups under their rule at a time, and now these same massacres are being repeated in the same way but with different tools and names, as back then it was the Othman Jammal Basha “the Butcher” who had ordered the executions, and today history repeats itself as his ancestor Erdogan “the Butcher” is the one committing these crimes. President al-Assad said that martyrdom is the most noble value to be championed by human beings anywhere in the world when they are defending their homeland, and the nobility of martyrdom isn’t restricted to the martyrs themselves; rather it extends to all those who continue to champion this value, and none can champion it better than the families of the martyrs. “If communicating and meeting with any of the families of martyrs in Syria is an honor for us and for every patriot in Syria, then how would it be when we meet someone who is a child of a martyr and joined the armed forces to walk the same path? 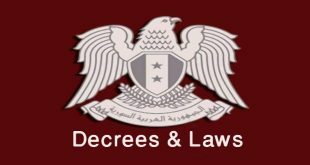 Certainly, the honor in that case would be doubled,” President al-Assad said, stressing that victory requires faith in the value of martyrdom, faith in God, faith in the necessity of victory, and faith by the society in those who are fighting for the homeland. “When a fighter believes in his cause and his victory, he will give us morale when he achieved victory in any battle, even if it’s a small battle, and when we believe in this fighter, we give him morale as a society, as a people, and as an incubator when he loses a battle,” His Excellency said. The President noted that Syria is currently waging a war, not just a battle, and wars are a series of many battles, and when one is talking about a war as vicious as the one taking place in Syria, then this involves thousands of battles, and it’s natural for this type of battles with the numbers and conditions involved in them to have them shift between attack and defense, wins and losses, and ups and downs, but the important thing is for faith in the inevitability of victory to remain unchanging. He stressed that when there are setbacks, the society must do its duty and strengthen the army’s morale rather than always expect the army to raise the society’s morale, as this process should be reciprocal, not like what some do when they try to spread frustration and despair over one loss or another or because they are influenced by external propaganda. 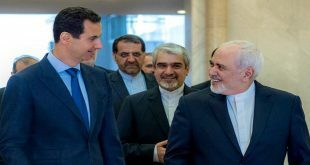 President al-Assad noted that the external propaganda was recently intensified after its failure 2 years ago, pointing out that the previous propaganda campaign failed despite it being accompanied by more difficult circumstances and the fact that many Syrians didn’t see matters clearly back then. “But the sponsors, promoters, politicians, and journalists who were involved in that campaign crawled back to their holes, and now they re-emerged because they sensed that there’s fertile soil in some people in this country,” he added. His Excellency asserted that patriotism isn’t mere talk, as it must be associated with bravery, noting that there is difference between concern and fear, as everyone is concerned over their homeland, and not just in times of crises, and that there is also difference between wisdom and cowardice, as some try to pass of cowardice as wisdom. “We shouldn’t live in a state of contradiction. In wars, there are wins and losses, and there are people who are now killing and crushing many terrorists on the confrontation lines, and these people wouldn’t have done that if they had been afraid. They are fighting and advancing, and some of them are fighting and emerging victorious, and others are fighting and retreating when circumstances necessitate that,” the President said. 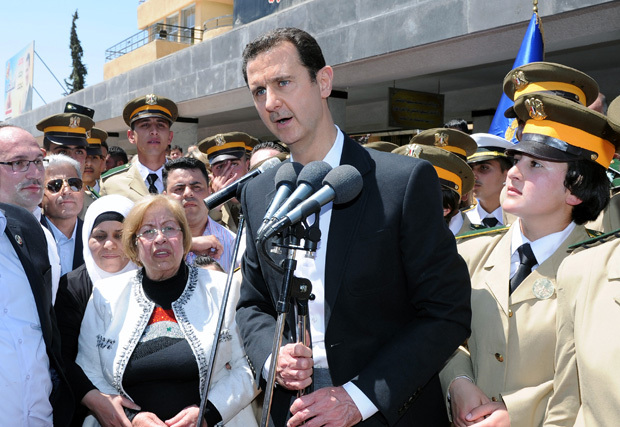 Addressing the children of martyrs who joined the armed forces, President al-Assad said “you are the answer to that propaganda campaign, and you are the medicine for those who are afraid,” stressing that honoring them means to honor all children and families of martyrs, all people who were injured while defending the homeland, and every soldier who stood fast in difficult battles. He affirmed that heroic battles didn’t start with the battle for Aleppo Prison, nor will they end with the siege on Jisr al-Shughour Hospital, asserting that the army will soon reach the brave soldiers who are currently besieged in the hospital in Jisr al-Shughour. “Through you, we salute and express love, respect, and admiration to all those like you, and we say that our faith in you is great. We say to all fighters and heroes that our love for you knows no bounds,” President al-Assad concluded. The honoring ceremony began with observing a moment of silence in honor of Syria’s martyrs and playing the national anthems, followed by performing a number of patriotic songs by sons and daughters of martyrs and presenting medals and commemorative plates to the honored cadets. In a speech delivered on behalf of the sons and daughters of martyrs, student Louay al-Kenj said that martyrs will remain beacons and heroic symbols of Syria’s glory, and that pursuing science and education compliments martyrdom in defending the homeland. Al-Kenj said that May 6th, Martyrs Day, is the day of immortal heroes who sacrificed their lives for the sake of Syria’s sovereignty and dignity, and that martyrs are symbols of honor like medals and laurel wreaths that inspire pride. 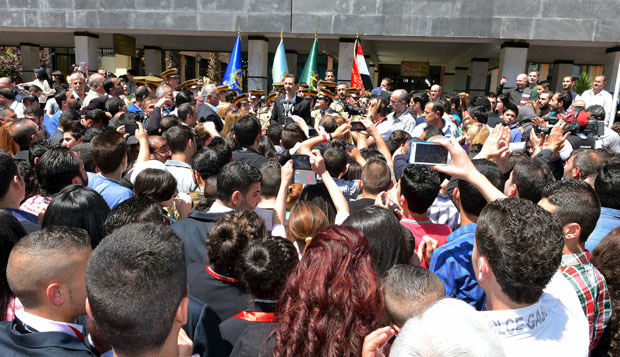 In turn, Director General of the Martyrs’ Sons and Daughters Schools Establishment Shahira Fallouh said that the Establishment decided to mark Martyrs Day this year by honoring the cadets who graduated from its schools and who decided to follow their fathers’ example in defending the homeland, voicing faith in Syria’s inevitable victory of terrorism.